Thad McIlroy – Future Of Publishing » Why is Ebook Formatting Still a Disaster? You are here: Home / Blog / Blog article: Why is Ebook Formatting Still a Disaster? There are also unofficial specifications, such as book trim sizes (different for the U.S. and the U.K.), that are so well entrenched in the practice of publishing that they might as well be standards. We could easily add to that fixed format EPUBs and PDF (still extremely popular for online reading). Keep in mind that PDF has variants as well, such as PDF/X and PDF/A (and PDF/A, PDF/A-1a, PDF/A-1b, PDF/A-2 and PDF/A-2). 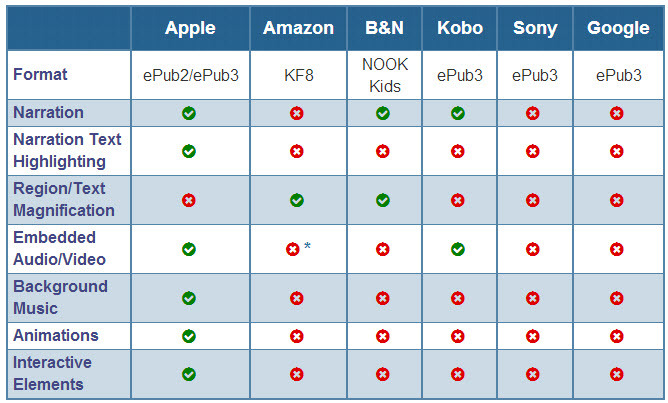 In my book, Mobile Strategies for Digital Publishing, I ran this chart, sourced from eBook Architects. It doesn’t consider all of the pain points of creating files in various digital formats. Instead it reveals something perhaps more painful: even when you painstakingly create digital files according to their published specs, different ereaders fail to support many of the essential file features. (This chart is more than a year old, and so the specifics have changed. But not the overall problem). As the IDPF (International Digital Publishing Forum) gathers today in New York City for its annual Digital Book Program we can only hope that the smart people in attendance will be working hard to reduce some of these roadblocks. I’ve argued against authors and publishers investing in embedded audio/video because I think most readers are not interested. But the chart above also offers another reason. Only Apple and Kobo support it. All that investment will be for, at most, 1/3 of a book’s market. Including audio/visual with an iBookstore version but not the Kindle version also creates an obligation in the minds of readers that when KF8 (or KF9) supports AV, a publisher must add it, resulting in more trouble and expense. Notice too how poorly most vendors support any features beyond those a novel or simple biography needs. Even animations and interactivity, useful for textbooks, are only supported by Apple. For the market leader, Amazon’s KF8 is particularly weak. Everyone, including Amazon, would be better off it the company had allocated the money it spent evolving its own standard toward supporting ePub 3. Is Publishing a Complex Industry?